Team Liquid versus PSG.LGD will be one of the most anticipated matches of the opening day of the Winter Clash 2018. With Team Liquid taking a short break from Dota and PSG.LGD cutting its teeth during the first competitive event for the 2018/2019 season, it will be a highly-contested game. Liquid may have not been part of the action in Malaysia last month, but they sent Mind_Control who helped NiP all the way to the quarter finals, finishing fourth with the team. Meanwhile, PSG.LGD had a bit of a struggle, dropping in the 6th slot, though their performance was not shabby at all, and we saw “fy” rally his team magnificently in the games against Virtus.Pro, losing by a hair’s breadth in all matches against the Russian squads. With Liquid rested and PSG having gathered momentum, it would be interesting to call the match. Round 1 of the MegaFon Cup will be a BO1, so calling a winner outright may be your best bet. 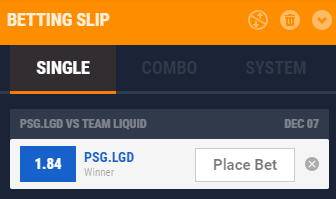 But how to do that when the odds are pretty close, with PSG.LGD given 1.84 and Team.Liquid backed with 1.96, according to GG.BET. Liquid are slightly less likely to win in this outright clash. They did finish fourth in TI8, but “Mind_Control” has been playing outstandingly all throughout the Kuala Lumpur Major, although “Ame” did pivot much of the success of PSG.LGD during the same tournament. Despite the slightly worse placing of PSG.LGD, they are still confident enough to take on Team.Liquid. The main hindrance in the Kuala Lumpur were Virtus.Pro who came blasting the series and destroying all competition. However, the MegaFon Cup, while it promises another match-up against Virtus.Pro, will most likely go in favor of PSG.LGD in the opening game, which will send them in the winner’s bracket. Betting tip / Prediction: PSG.LGD wins the match. First time placing a bet? There’s a beginning for everything! Check our Dota 2 betting guide and grab one of our exclusive bonuses for your first deposit.